In the Bronze and Iron ages there was a significant settlement in the region of what we know as the Nazareth valley area. It was known as Japhia in the Bible. This city was destroyed by the Assyrians around 700 BCE. From 700 BCE to roughly 100 CE: no material evidence exists testifying to a settlement in this region. Eleven pieces of moveable evidence (pottery, oil lamps) have at times been upheld as evidence that a settlement was re-established in the centuries prior to the turn of the era. In every case but one these pieces of evidence have been redated to later times; the exception is a piece redated to the earlier Iron Age. 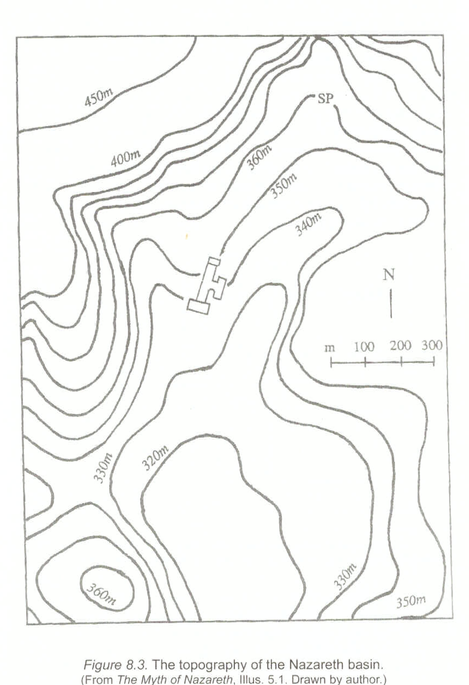 Approximately two dozen kokhim tombs in the Nazareth basin. 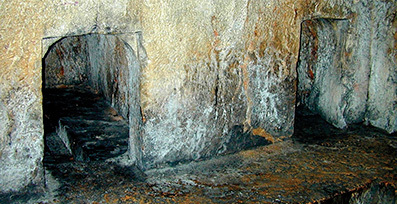 According to “Hans-Peter Kuhnen — a leading expert on kokhim tombs in Galilee — those tombs first spread to the areas north of Jerusalem from the south, and they did so not before about the middle of the first century CE.” Given that around 90% of the artefacts from the Nazareth basin that have been published have been found in these tombs, it follows that the bulk of Nazareth evidence dates to well after the turn of the century. Examining the published literature (e.g. Varda Sussman), one learns that “Herodian” is an erroneous label and the lamp is more securely dated to well beyond the period of Herod the Great. There is no cliff in the region over which one can toss anyone to their demise. The hillside does reach 20% in places and his too steep for the construction of dwellings. Could they have terraced the hill for this purpose? Problem is there is no indication of any terracing in the region around the traditional site of the village — around the Venerated Area of Nazareth. Besides, there is a nice flat valley floor nearby. Dozens of kokhim tombs on the hillside further shows the area was not used as a settlement. Even the Venerated Area is located in the middle of a Roman-era cemetery. The Church of the Annunciation sits on three to five such tombs. Tourist guidebooks do not advertise this fact. As mentioned, this post is only a general overview of the relevant archaeological evidence (or lack of evidence) for the existence of Nazareth in the early first century. How this state of play has been misrepresented in the media, often with the encouragement of media-savvy archaeologists, is elaborated in depth in NazarethGate. I look forward to posting more from this book. Posted on 2016-02-22 20:21:38 GMT+0000 by Neil Godfrey. This entry was posted in New Testament Archaeology and tagged Nazareth, Salm: NazarethGate. Bookmark the permalink. So does this mean that the gospels that mention Nazareth could not have been written until Nazareth was reestablished after 100 ce? Or that references to Nazareth were added later? 100 CE is a rough indicator, not a precise divider. We can allow that a village appeared in the are after the fall of Jerusalem in 70 CE. Some of the moveable evidence is dated in round figures from 50 CE to much later, say around 150 CE and beyond. So technically we can even allow for a resettlement from around 50 CE. The evidence that the Gospel of Mark originally mentioned Nazareth is not secure. Matthew certainly mentioned the township and used its existence to explain the name given to Jesus — notwithstanding (as a few scholars have pointed out) no religious leader anywhere else is named after the place of his birth; and how would a place nobody supposedly heard of act as an identifier anyway? The more likely explanation is that Jesus the “Nazarene” or whatever variants we have of that term originally referred to a cult or sect in which the term had some other meaning that the author of the first gospel tried to deny/hide by reassociating it with the town of Nazareth. This could have been almost any time after the fall of Jerusalem in 70 CE. Assuming Rene Salm has shown the short-fallings of the archaeological data for Nazareth, I am puzzled. Why does this imply that Nazareth was invented, as opposed to an alternative thesis, that the conventional or consensus location of Nazareth is incorrect? All I see from the NT is that Nazareth was in Galilee, had a synagogue, and was located on a hill. Surely there are multiple archaeological sites that fit this criteria. I am reminded of Gamala, for which the archaeological site accepted for decades didn’t fit the description in Josephus — until the actual site of Gamala was discovered which fit all the details to a tee. Why not look for a better archaeological match instead of jump to a conclusion that Nazareth never existed? Beyond the reference to the subtitle of the book itself, which Neil does not really own or seem to embrace, the post makes no claim that “Nazareth was invented.” The focus of the post seems to be bad archaeology. 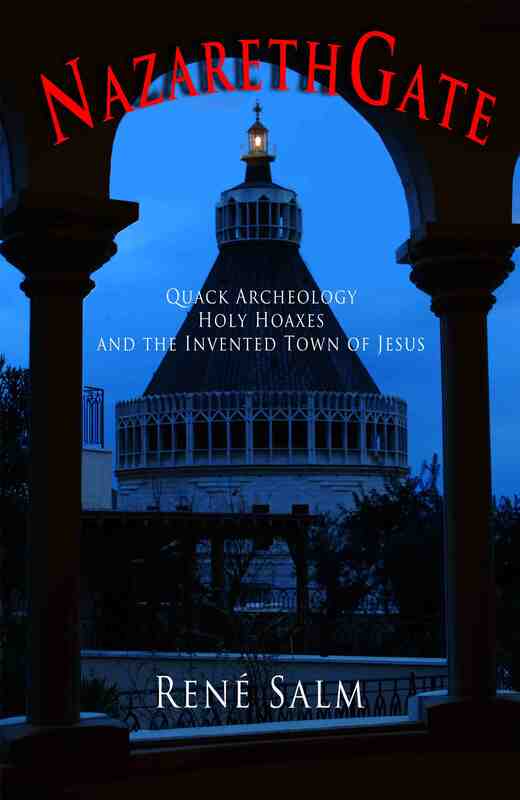 You probably need to read Salm’s book to understand what he meant by arguing that Nazareth was invented and whether or not he considered your alternative hypothesis (which seems an entirely plausible alternative). On an unrelated note, your new book is now available for pre-order on Amazon. I ordered my copy today and look forward to reading it this summer. Cheers. Then write a simple formal review? Salm makes a very powerful case for the unprofessional behaviour of certain archaeologists, their clear biases and mishandling of evidence in the service of their faith or publicity. After reading Ken Dark’s response to Salm in BAIAS and the further discussions since I have lost all respect for Dark as a professional. I will be having more to say about a number of others in future posts. It could well be that there is another site unrelated to the Nazareth that has existed since mid to late Roman times up till today that was the actual town of Jesus. Perhaps it was destroyed and lost forever in the first revolt against Rome and another village was constructed in the site of present-day Nazareth and took the same name. Although this would seem unlikely if Luke’s description of the site as a “city” is as historical as its having a cliff. But Rene Salm’s central argument is that the Nazareth of the turn of the era, the town of Jesus and the gospels, is an invented town. It only began to become an urban dwelling between 70 and 135, and Frank Zindler argues that it only acquired the name of Nazareth as a result of the work of Eusebius (and was only “discovered” by Constantine’s mother … details for another time. — From Frank Zindler’s Foreword to NazarethGate. So there are reasons to suspect there was no Nazareth until it became a literary invention in the gospels. There’s always a possibility it will turn up somewhere else, but unless there are good reasons to go looking . . . . I think also it’s worth keeping in mind the many puns in the gospels, especially Mark, of both personal names and place names; and the theological metaphors attributed to places. Bethsaida, Bethphage — they may have been real, but they also were conveniently apt names as settings for narrative acts. As Fredriksen and Mack have written about the “cleansing of the Temple” action by Jesus, it may have been historical, but why add unnecessary explanations when we find a completely satisfactory one in the requirements of the plot itself? Salm acknowledges that the town came into existence some time between 70 and 135 CE. My own take on this would be that it is unlikely any of the evangelists and few of their readers actually knew the town of Nazareth at first hand. Only Luke offers any topographical colour and that is entirely for narrative purposes. And we know Luke was capable of inventing historical details to fit his plot’s designs. But then it is also possible that the post 70/135 village was not given the name of Nazareth till the time of Constantine’s mother. Did Matthew invent the obscure town nobody had heard of to deflect attention from a less comfortable meaning of that other cultish term applied to Jesus? This isn’t a new idea. I don’t remember when or where I first heard of the idea that Nazarene meant being a member of a sect rather than an inhabitant of a village. It was at least 20 years ago. The idea was that by the time the gospels were written, the original meaning had been forgotten. The Gospel authors assumed the term referred to Jesus’ place of birth because it never occurred to them Nazarene could refer to a sect. But the word Nazareth is not used in Paul’s epistles or in the old testament. One would expect the name to be found elsewhere if the village/town was ancient. I read somewhere that there are no references to the town Nazareth (outside of the gospels) before the 4th century when St Helen, mother of Constantine was touring the Holy Land building churches and buying relics. Some enterprising elders rapidly changed the village’s name to Nazareth and built a shrine in a cave in the hope of gaining some funding. Last I looked, the word “Nez” or naz also meant a (reasonably) high point or lookout? Possibly related, I speculate, to the later French “nez.” Or the English “nose.” Or ” nasal.” Some later residents, perhaps due to linguistic confusion, were said to be supercilious. Or to have had their noses in the air. This doesn’t rule out a relation also, to the oath of a Nazarene, or a Nazarite. Apparently the modern town is situated in a last range of mountains. Overlooking a plain. Possibly it was an obscure lookout point. One day I’ll do a post on some of the possible meanings of “NZR” and cognates attributed to Paul’s sect and Jesus. But till then you can read of several in NazarethGate. Meanwhile, Salm also covers them in archived posts at http://www.mythicistpapers.com/ under the heading “Nazarene”; particularly http://www.mythicistpapers.com/2013/02/18/the-natsarene-nazarene-religion-pt-5/. His position (which I find generally convincing) is that it derives from the pan-Semitic root “nun-tsade-resh, ‘watch, keep, preserve,’” and he develops a speculative case for a broad and much more ancient “gnostic” tradition associated with it. In an attempt to show that Jesus fulfilled a supposed scriptural prophesy of Judges 13:5 (which actually referred to Samson), the unknown author of Matthew might have confused “Nazareth” and “Nazarene” (a person from Nazareth) with “Nazirite” (a man who lives apart and has made a vow of abstinence). This isn’t too surprising if you realize that the gospel authors’ native tongue was probably Aramaic, the (Old Testament) Scripture was originally in Hebrew, they were likely reading it as the Greek Septuagint, and they were writing the gospels in Greek. Carruth, S; Robinson, J McC; Heil, C. (1996) Q 4:1–13,16: the temptations of Jesus : Nazara. Peeters Publishers. p 415. ISBN 90-6831-880-2. ‘Nazarite’ is supposedly an ‘Anglicisation’, but that is the translation given to use in the OT.